IMPORTANT: The date you select as the Requested Delivery / Ship Date is the date your gift will leave our facility. Orders received by times listed in our Calendar below are eligible to be shipped as indicated. When selecting USPS Regular Priority allow up to three (3) business days for in transit shipping depending on destination. 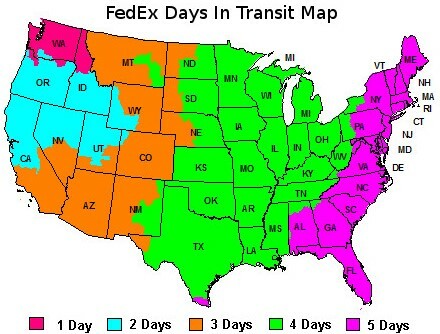 When selecting other carriers, allow up to seven (7) business days for in transit shipping depending on destination. 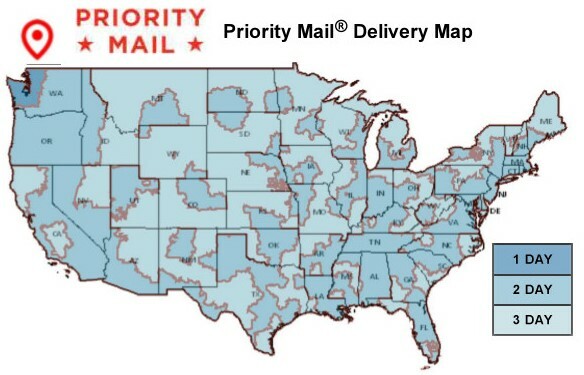 See maps below to determine how many busines days your gift will be in transit to its destination (USPS Parcel Select Map Not Available, UPS In Transit is the same as FedEx. NOTE: Times are calculated in BUSINESS days. To calculate shipping rates: After adding your selected gift to your cart, click on Estimate Shipping and Tax to see the cost of shipping. Shipping rates are calculated using real-time rates. A tracking number will be attached to your order as soon as your gift is ready for shipping. You can track the shipment by logging into your account. Chocolates are shipped from September through May. Chocolate is replaced with other sweet treats that are not perishable in heat during summer months unless being shipped to a Washington State or Oregon address when temperatures are below 70 degrees F.
We currently only ship to US addresses.